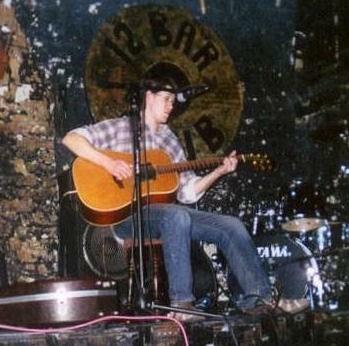 When I first started playing solo acoustic gigs as an 18-year-old, one of my ambitions was to play at the 12 Bar Club. The 12 Bar is a small (150 capacity) but rambling live music venue at the far end of Denmark Street, close to what I’ve come to think of as Google Plaza but which is, I guess, still properly St Giles Circus. It consists of four rooms, in an L shape, with the tiny live room at the back. If you were starting a music venue from scratch, you wouldn’t plan anything like the 12 Bar. The site of an old forge, it has a tiny stage (made smaller by the remnants of the furnace), a small area for punters standing (or sometimes sitting) in front of the stage, an overhanging balcony that came up level almost with the front of the stage but only sat about 15 people, and no sound insulation from the bar, which despite being in a different room is only about eight feet from the stage. Yet despite all these seeming limitations, I love it. If you want to know how important a venue the 12 Bar is, think on this: in its 25-year history, veterans like Bert Jansch, the Albion Band, Gordon Giltrap and Peter Rowan played it. Roddy Frame, Boo Hewerdine and Robyn Hitchcock played it. Martha Wainwright, Joanna Newsom, KT Tunstall, Damien Rice, Regina Spektor, the Libertines, Keane, Jamie T, even Jeff Buckley played there. Whether I or you or anyone else likes those artists is not relevant in this case. 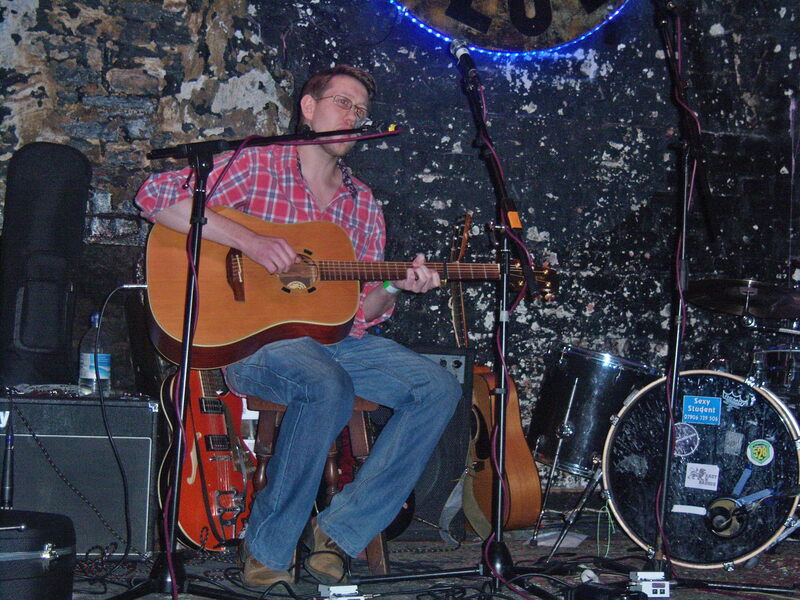 What is relevant is that for a couple of generations of musicians, the 12 Bar Club has been an important rung on the ladder, one which you could play knowing whose footsteps you were walking in, and as a result its warmly regarded by practically everyone who’s ever played there, folkie, anti-folkies, punk rockers and roots songwriters alike. I’ve played it more times than I have any other venue: a bunch of solo gigs (six or seven probably – conceivably more), a few with Yo Zushi, one memorable show with Great Days of Sail (the band I was in with Yo 10 years ago), an early gig with my old band the Fourth Wall, the last-ever Fourth Wall-related show. So I have a lot of happy memories of that place. The show where I supported Berlin-based American songwriter David Judson Clemons, which I think was the first time I played solo there. The aforementioned GDoS gig, which we packed out, the one and only time I’ve been been part of a spontaenous, unplanned encore: James McKean joined us to sing You Ain’t Going Nowhere and the on-stage crowededness crossed the line from “impractical” to “farcical”. The time when I looked up during my set and realised that TV newsreader Martyn Lewis was watching me (his daughter Sylvie was top of the bill that night), looking very serious and newsreaderly. That time when a group of very dressed-up soul music fans who’d come to watch an after-show set by Roachford caught the back end of a Yo Zushi Band set (a particularly ill-prepared one at that) and looked rather flummoxed by what they saw. In 33 days it will be closed, a casualty of the Crossrail development. The large Enterprise rehearsal complex, across the alleyway (Denmark Place) behind the club, will close also. I don’t know whether the buildings will be demolished. The 12 Bar is part of a terrace, so if it is to be knocked down, I assume that Hank’s guitar shop next door would have to go, too. Enterprise could be knocked down without it affecting the fabric of the buildings that face on to Denmark Street though. Conceivably the property developers (Consolidated) just want a nice shiny retail outlet there and would rather the place wasn’t filled with scruffy rock’n’rollers. We’ll have to see. I’m not optimistic about the future of Denmark Street though. I suspect that rents will continue to rise and the instrument shops will bow to the inevitable. With no form of rent control in place, central London real estate is too expensive for independent retailers, even niche ones like instrument shops. Unless Denmark Street is made a conservation area like Hatton Garden (and Consolidated are obviously not keen on this), an era looks to be ending. Andy Lowe did a heroic job programming the live music there. In the course of more than a dozen gigs I played there, the bills were always high quality and thoughtfully put together. I was never on the bill with an inappropriate act, I never saw anyone on there who wasn’t up to the job. I could say that about no other venue. He did all this while being tremendously likeable and friendly, and without wanting to take up too much of his time, I stopped for a chat with him whenever I could. There have been rumours about this for a long while, and the 12 Bar Club’s owner, Carlo Mattiucci, has obviously been prepared and look set to move the club to a new venue. But still, this is a terrible shame for London’s music-playing community. With Enterprise, the 12 Bar (and across the street the Alleycat) and the retailers, Denmark Street has been a real community, where musicians played, rehearsed, bought gear and hung out. That will end now. Nothing they could put in its place there will ever replace that. This entry was posted in Gear, General, Music and tagged 12 Bar Club, 12 Bar Club closing, Andy Lowe, Bert Jansch, Boo Hewerdine, Charing Cross Road, conservation area, Consolidated property development, Crossrail, Damien Rice, David Judson Clemmons, Denmark Street, Denmark Street redevelopment, Enterprise, Fourth Wall, Fullbliss, Gordon Giltrap, Gordon Giltrap and Peter Rowan, Great Days of Sail, Hatton Garden, James McKean, Jamie T, Jeff Buckley, Joanna Newsom, Keane, KT Tunstall, Martha Wainwright, Martyn Lewis, Peter Rowan, Regina Spektor, rent control, Robyn Hitchcock, Roddy Frame, St Giles Circus, Sylvie Lewis, the Albion Band, the Libertine, the Libertines, Tottenham Court Road, Yo Zushi on December 13, 2014 by rossjpalmer.